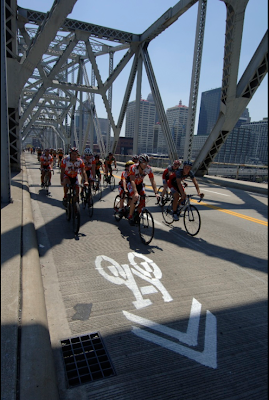 It is pretty cool that my town, Louisville, KY, was named the 21st best cycling city, by Bicycling magazine. Each city gets one picture in the feature, and Louisville’s snapshot features yours truly on the tandem with Will as stoker, my best-friend Bob Bobrow to our right, and one of the Mandrola’s favorite teenagers, Andrew Llewellyn to our left. Sadly, even tragically, is that this picture (circa 2007, by Tom Moran) was taken during a memorial ride for “Chips” Cronen, an experienced 57 year old cyclist who was killed by an inattentive motorist on the second street bridge; which is still the only way for cyclists to ride a bike across the Ohio river in our city. Here is a picture of my road bike taken after being struck while riding in my neighborhood by an inattentive police car. Yes, that’s right, run over by a police car. I was going straight through an uncontrolled intersection, when the oncoming police car turned left right in front of me. In the instant before the bumper hit me, I thought, “ah, it’s a police car, surely he sees me.” Wrong! Interestingly, the police officer who hit me was being sued for striking and killing a pedestrian a year previous. Luckily, I suffered only road-rash and a monster hematoma. The twenty-first best cycling city has many more bike versus auto tragedies to tell. In recent years, two teammates of mine spent months in the hospital after being struck by inattentive motorists in our bike-friendly city. In bike-friendly terms, Louisville is moving slowly in the right direction, but the hill is long, and the summit is far in the distance. It is true that cycling is good for our bodies and minds. It is environmentally favorable as well. However, riding a bike on the same roads as autos piloted by the busy, the distracted, and often irritable, is not without risk. We cyclists try to mitigate this risk as much as possible, but like most adventures in life, zero risk is unobtainable.